Nonalcoholic fatty liver disease responds to cinnamon as an Iranian study has shown. This is rather unusual, as conventional medicine has nothing effective to offer at this point in time for nonalcoholic fatty liver disease (NAFLD). The study consisted of 50 men and women between the ages of 20 and 65 with NAFLD who the researchers randomized to receive two 750mg capsules of cinnamon or similar looking capsules as a placebo. The trial lasted 12 weeks. Blood samples were taken before and after the treatments. Markers that were analyzed were C-reactive protein, liver enzymes, fasting blood sugar levels and lipids. 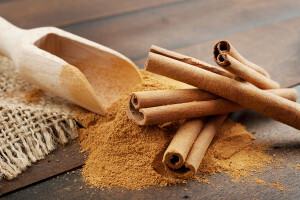 Following treatment the group that had received cinnamon had significantly lower blood sugars, triglycerides, total cholesterol, liver enzymes, C-reactive protein and insulin resistance. The placebo control group had no essential changes in their blood values. If left untreated NAFLD has a poor prognosis, as a significant percentage will usually develop liver cirrhosis, and eventually liver cancer. Both of these conditions can result in death. According to Ref. 2 there is no effective treatment available for NAFLD. The major causes for this condition are obesity, diabetes and treatment with corticosteroids. Symptomatic treatment consists in helping patient to lose weight, improving diabetic control and weaning the patient off corticosteroids. In view of this encouraging randomized trial it cannot harm to try two cinnamon capsules per day under doctor’s supervision. This treatment seems to be effective in reducing the inflammatory markers that otherwise characterize this condition. More information is available at Liver Cirrhosis where it is described that nonalcoholic fatty liver disease can cause this.